This is a true story about the the inspection that never happened!!! Its a true story about a foreign company with no presence in Asia (but lots of presence in North America), who spends hundreds a millions a year on products from Asia, but chooses to hire a 3rd party for their inspections. This company believes in hands off management for their products, supply chain, and people involved. It is a common occurrence for many companies who lead from behind and walk in the dark, not knowing whats in front of them. Its ignorance or possibly its arrogance. Its about “Reactive over Proactive” management. Who is involved, why are they involved, what do they bring to the table, how will they participate? The when and where is a completely different story, and depends on the supplier, factory, and more. The “More” depends on the quality, expertise, experience and integrity of your staff. Many companies hire trusted individuals in North America to oversea their department or corporations in a specific area but those individuals or those that hired them have no true understanding of the supply chain, the product lifecycle (PLM), and the operations of those who manufacture their products. I was involved in one of these scenarios and along the way, and I hired a seasoned professional (see above photo) with 25 years of experience in QA/QC management. We spent countless days and hours improving the product, training the staff only to have the hands off executives (companies) who were involved to step in and decide to outsource the QA/QC end of the business. Unfortunately the North America executives, who visited the manufacturing country six times a year, didn’t think QA (Quality Assurance) was important, and focused only the surface of the QC (Quality Control) inspection. 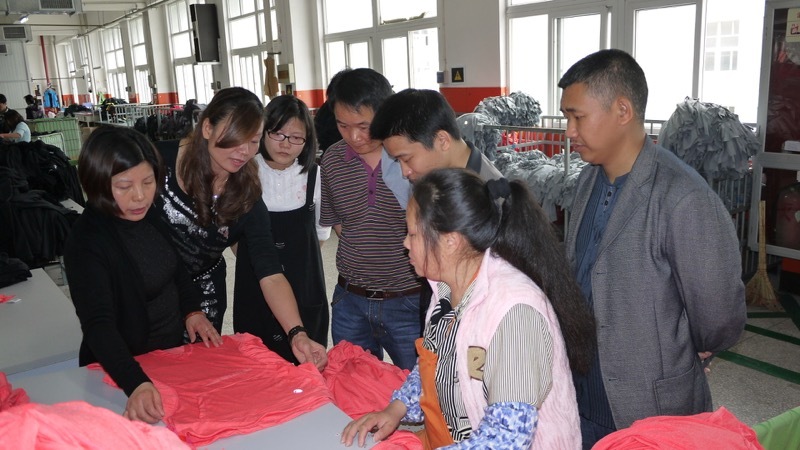 As a 3rd party, you are hired to do a defined task, which is to act as the QC (Quality Control) for the buyer and determine if the shipment is a pass or fail. If you fail the shipment the factory will have to fix the problems, and possible the 3rd party inspection will be brought back in, but from my experience, the 3rd party never returns. If the 3rd party returns, chances are it will be a different inspector, with different eyes, culture, beliefs, and habits. As an employee of the company (buyer) you job is to ensure the proper QA (Quality Assurance) procedures are being followed, and to inspect the shipment for QC (Quality Control). If you fail the shipment, you will have to make an action plan with the factory to fix the problems in a timely and effective manner, and you will have to schedule a time to return to reinspect the shipment. As an employee you may return to the sewing floor at any time to ensure the problems are being fixed properly. You need a large clean surface with proper lighting and the basic tools of stickers, tape measure, camera, and a computer. In earlier stages you made need actual approved fabric swatches (not Pantone books), magnifying glass, and other testing tools for fabric and trims. 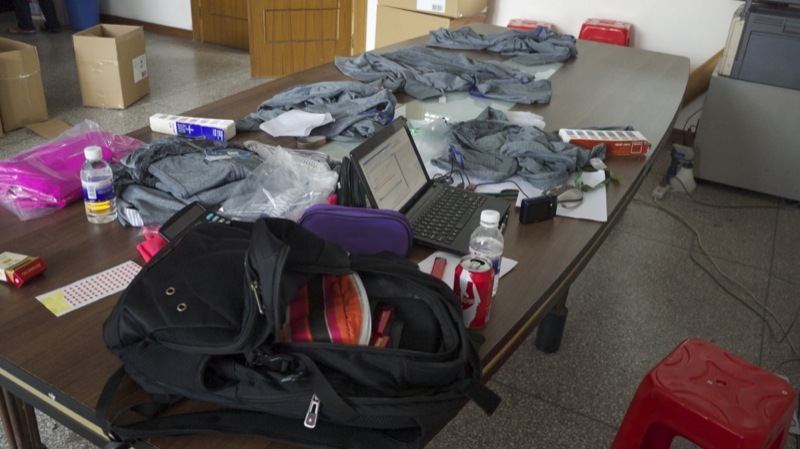 Below is a photo of the 3rd party inspection table at 1:00pm, the inspector had already been there for 3 hours and was at lunch at the time of the photo. The 3rd party inspector went for a lunch of his choice with the factory manager, which is usually for visiting guests. In developing countries the role of the manager is to build relationships, it’s the same as in the Western world. I see Pantone color booklets on the table, why Pantone books, Ideally for final inspection, the inspector should have buyer approved fabric, color, and artwork (This should not be done at final inspection, this should be done at reciving of trim of fabric or at the time of decoration). Reactive Management!!! I see four crumpled up garments but nothing looking looks like an inspection is taking place. Ideally there should be piles of products, nicely folded for review, with boxes beside the table for approved products and packaging. None of this was present at this inspection. Below is a photo of an inspection I lead and participated in during my random supplier (factory) visits. There should be piles on the table for different types of discrepancies, that are reviewed after the inspection, before anyone leaves for the day. The table is engaged and active for participants and staff to review products, look at problems, and discuss solutions. 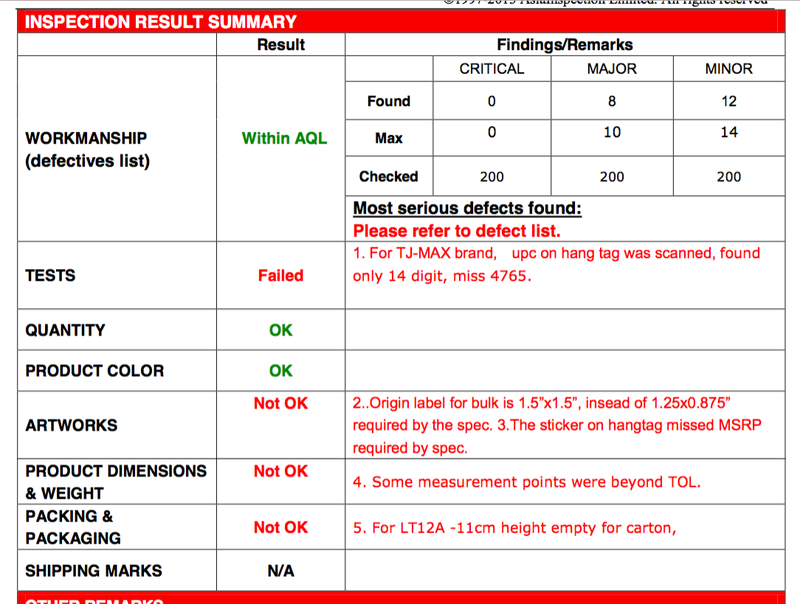 This single final inspection was for 3 styles, total quantity of 13,000 units, roughly 4,300 units per style, under 2.5 AQL Inspection standards, there should be 200 units inspected per style, which for this shipment is a total of 600 units. I went to visit the 3rd party inspector at 1:00pm on the day of the inspection and after 3 hours of inspection there were twelve boxes in the room of which four of them were open, see below photos. This looks like the most organized inspection, all the boxes still look full, imagine if you opened every box, inspected each piece, it their was 20 units in a box, you would have 20 poly bags, and 20 unfolded (folded, as I like cleanliness) garments. 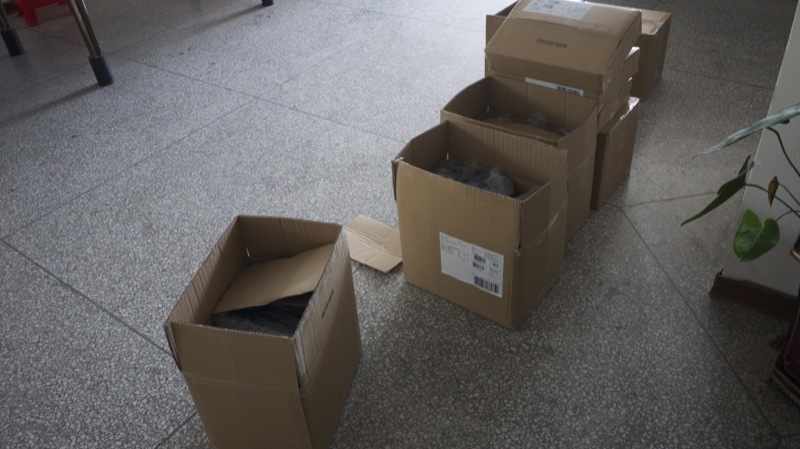 In the above right photo, I see seven large boxes (24 units) and twenty small boxes (6 units), total quantity of opened boxes in the photo is 288 units, the bottom right photo there is ten large boxes (24 units), total quantity of 240 units, the grand total is 528 garments and the AQL 2.5 is 600 units. 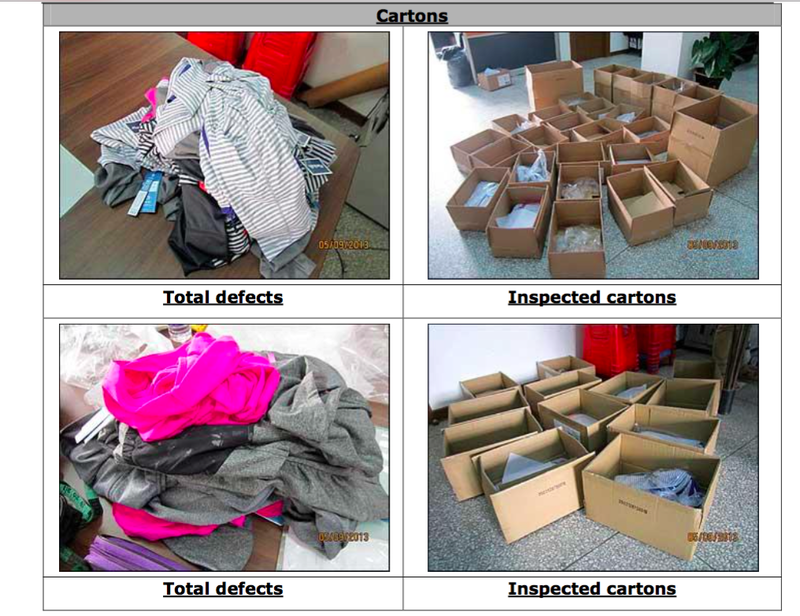 If this inspection of 528 units took seven and a half hours of the inspection day, that is equal to less than 1 minute a garment to spend one hour travel to and from the factory, count all boxes by style (verify to packing list), select the inspection boxes, have them moved to the inspection room, inspect all garments and measure 4 – 12 pieces per style, go for two smokes an hour, with thirty minutes being allotted for a management review. Then someone has to take all the information and write a beautiful and detailed 67 page report all for USD $200 – $300 per inspection. On the defective products, I wonder where are the stickers that highlight the problems, usually I place the defective problem facing up, so it’s easy to locate and manage? From this photo it looks like all products are put together in one pile. 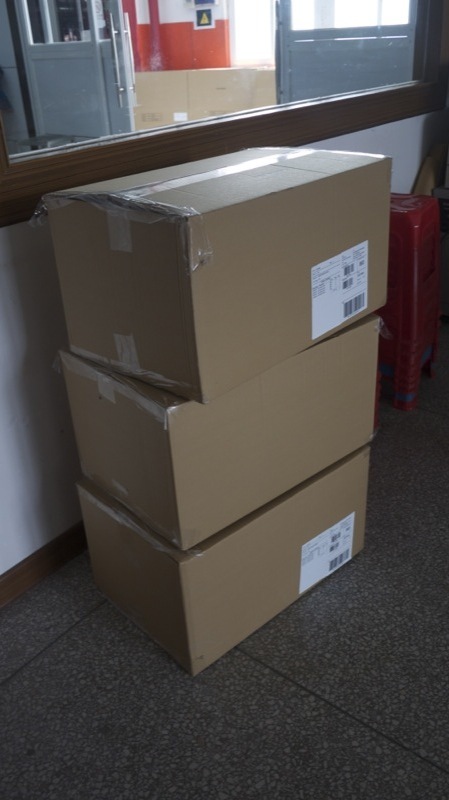 This inspection took less than 8 hours, and when I went to the inspection room at 5:30pm, all boxes and products were removed from the room and sent back to factory floor. Out of 3 styles inspected only one style possibly passed for workmanship (within AQL), the other styles had major issues. This partial inspection, took our experienced staff a full day to inspect and review with the supplier (factory) staff. 225 units times a seven hour inspection day, is equal to less than 2 minutes (more than double the time) a garment to spend one hour travel to and from the factory, count all boxes by style (verify to packing list), select the inspection boxes, have them moved to the inspection room, inspect all garments and measure 4 – 12 pieces per style, with one hour being allotted for management review. One fact I must tell you, is that our own QA/QC would spend 10-12 hours a day working, not 8 hours as per a 3rd party inspector!!! That is half their life including their travel time (this can be another 1 – 6 hours), sleeping, eating, and family time. Its a power struggle for the local and experienced staff to stand up to the factory manager and owner, as their power and status is much stronger/bigger than theirs. As a 3rd party inspection, qualification, authentication company your job is to provide qualified and trusted services to your customers. Staff that work for you will work for a fraction or comparable cost of your customer hiring a full-time employee. You will have to take into consideration operating, management, and marketing costs on top of the individual inspector costs. I am baffled and confused when your price is comparable to a qualified and experienced full-time employee. But I understand your staff will have less experience, and are experts in all types of products, which makes your staff professional inspectors. One inspector I spoke with advised he will inspect computers tomorrow, automobiles the next day, toys the following day, and it has been weeks since his last apparel inspection. It is a known fact that inspectors take money under the table to pass shipments, as their monthly pay is not sustainable for their family and lifestyle. This also builds their relationship, avoids confrontation, and power struggles. How many of you, really understand the TCO? Many would prefer to plead ignorance, or maybe it is Ego, Attitude, and Arrogance. Its your/their responsibility, so get to know it intimately. Presence is everything, use your intelligence, you hire a third party to do your inspection for that production once, twice, three times? The inspection company is in business to provide solutions, they will give you the most beautiful and satisfying report you/I have ever seen. This is their job and they do it well, hence they are in business, and convincing you or your staff to believe in them. What is the cost per inspection? What is the monthly cost of the employee? What is the travel, hotel, and food cost? What is your operational cost in your offices and in that country? What is the cost for the end consumer who is not happy? What is the cost to the customer (buyer)? What is the cost for a senior executive to fly to your/their manufacturing center, their hotels, transportation, food, and expenses? What costs have I forgot? Or choose to ignore? I have only covered the what, what about the when, where, why, who, and how? Why does the buyer come back for more abuse? When does the abuse stop? Once your/their products hit the selling floor, there is no going back, so you need to ensure your end customer gets a quality product, to tell their friends, so they can tell others, and your business with continue to blossom even without market momentum. So your inspection really didn’t happen, and when you, the senior executive in the manufacturing country (eyes and ears) on the ground report it to the buyer (fellow comrades), with proof of the follow up inspection. The executive who hires the 3rd party, gets emotional and takes it personal and goes after the third party inspection company. This becomes his story to prove himself, by having others lose face. The buyer goes after the third party inspection company, who goes after the manufacturer, the manufacturer goes after the senior executive and staff on the ground who are there to report their findings. Everyone loses face, except the senior executive in the main office who feels good about himself as he protected his decision with a vengeance. It is no longer a team sport, it’s about individual glory and satisfaction. So “eyes wide shut”, the buyer continues to use third party inspections and has let go of their qualified QA/QC staff and executive management located in or nearby to the manufacturing country. So if you are buying from this company, you can look for inferior products, category, and sales declines, unless the market has natural momentum, then it’s about the feeling not the quality of the products. But in time poor quality products will come back to haunt you. Remember we are all proud of where we are from, and will stand up for our country and people with pride and dignity. Some foreign companies (brands) have a presence in that country, while others prefer hands off management, and will only visit the manufacturing country 4, 6, 12 times a year. Many companies will empower locals (localization) who understand the languages, culture, ethics, and principles. The locals are proud, and will do everything to ensure their community and culture is sustained, first and foremost they will look after the people and companies within their own promised land, remembering where they are from, supporting the economy, and being thankful to those who give them appreciation, respect, and support (what is acceptable in a third world developing country may not be the same as where you are from). This is the harsh reality of the world that surrounds them/you as they/you continue on their/your path of existence, growth, and maturity well they/you jeopardize their brand integrity, image, staff, and customer morale, which ultimately affects the revenue and ROI. Thanks for your excellent experience. I am agreed with your every point point to observation and comments. Dont negotiate on competence….. invest on it.